I was very impressed with the amount of work that went into developing the camp. Like most people and organizations, we were aware of the camp’s existence for a number of years, as well as the controversy surrounding it. My wife Joan and I spoke on it at a fundraising dinner at a church in Vancouver. The 7 members on the BC First Nations Leadership Council meets with senior officials from the Royal Canadian Mounted Police (RCMP) from time to time, pursuant to a safety and security protocol. 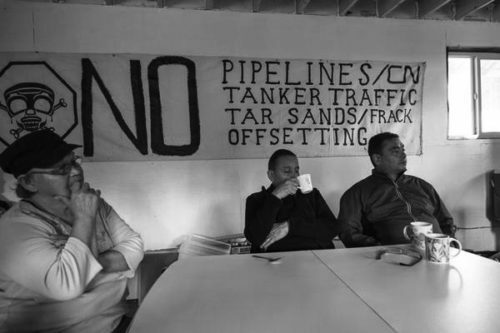 The RCMP requested meetings regarding the Unist’ot’en Camp, and we met with them on two occasions. In the first meeting, with myself and the executive director, Don Bain, the RCMP raised their concerns about the camp’s presence being opposed by some neighboring First Nations – because of their involvement in LNG contract work. They were making some very aggressive remarks, and we didn’t appreciate the tone of the comments, particularly when they talked about physically removing the camp. In the second meeting, this time with the entire Council, there was no doubt from the RCMP’s commentary that they had plans of moving into the camp. Our statement was that we absolutely would not support that, and it was not necessary. The RCMP later denied the aggressive statements were made. Time progressed and there were reports that the RCMP were mobilizing their forces. 200 RCMP officers were involved in an operation to forcefully take down the camp, taking up hotel rooms in Burns Lake, and Smithers. At that point, I decided I was going to visit the Unist’ot’en camp. I drove all night to get up there, and an APTN reporter happened to be on the same flight there as Chief Shane Gottfriedson. All 3 of us ended up going into camp together. The RCMP had a bogus claim that the camp is impeding major transportation or highways, but the road goes into nowhere – into old cut-blocks, ending a few kilometers after the checkpoint. It was a little bit tense at the beginning- we arrived wearing vests, in a black Yukon truck – the people at the first checkpoint were not aware of who we were, and thought we might be RCMP. We spent the afternoon there, and came out around suppertime. Upon arriving, I was very impressed with the amount of work that went into developing the camp. When you hear the word “camp” it suggests something temporary or makeshift, but I was so impressed with the buildings – how well constructed and up to code they were. It was all very well planned, well established, and organized. We spent the afternoon visiting elders and spokespeople. When we were in the camp we were treated with respect, we took “selfies”, and it was very cordial. Word quickly spread throughout the Wet’suwet’en nation that we were coming, and by the time we had left camp in the evening, there was a group of about 25 upset people waiting at the foot of mountain. They were doing contracting work, and had organized a gathering at a hotel in Houston. I had the opportunity to meet with them, and spent 3 hours hearing their side of the story. I explained it was a matter of public safety. 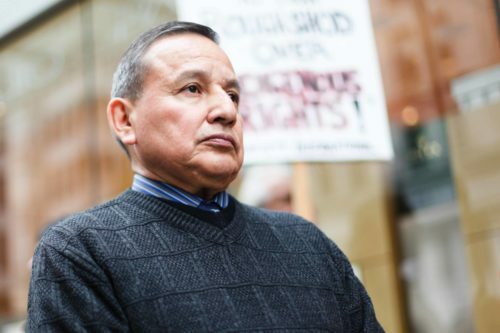 I felt if I were to visit the camp, it would create a very public awareness of the impending raid, and the RCMP would reverse their decision – which they did. A public letter was developed to tell the RCMP to back off, with 400 individual groups and high-profile international signatories. There is no need to use police force at the Unist’ot’en camp. In the event the RCMP were to attempt it again, there would be even more public opposition. I never have and never will support heavy handed police tactics. I wouldn’t hesitate to come back again. On behalf of Joan and myself, we send warm regards to everyone at the camp, elders, spokespersons, and supporters.